In my humble opinion, the Pacific Northwest in one of the most beautiful places our country has to offer. From spectacular granite cliffs, to sand dunes to majestic waterfalls cascading through dense, green foliage. Back in another lifetime, I went there when I could, to re-charge my batteries through the peaceful energy Mother Nature provided in her most spectacular locales. The 620 foot Multnomah Falls is the most well-known of a series of 77 waterfalls that dot the Oregon side of the Columbia River Gorge. 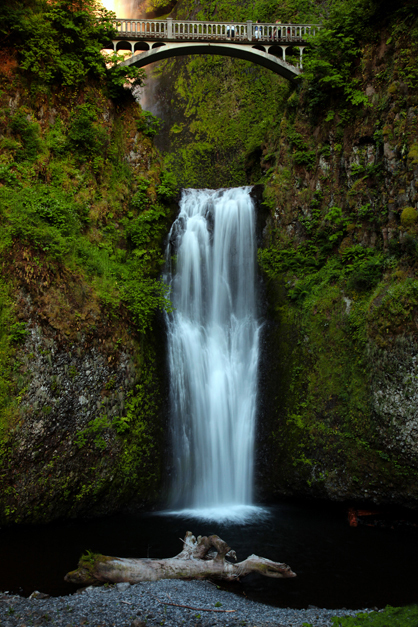 There are only three higher falls in the nation and Multnomah is arguably the most beautiful of those. A trail from the famous Multnomah Falls Lodge (built in 1925) climbs up the side towards the Simon Benson Bridge and then winds further towards the top. Due to 25 years of spine issues, although I have been known (on a good day) to head down a relatively level trail, this uphill battle was not one that I took on. Instead, I tried unsuccessfully to capture the entire falls, including the zig zagging upper part, in my frame. The bright light at the top of the image is from the setting sun which also prevented me from properly exposing the entire falls. Finally, using a wide angle lens and a tripod, I cropped out the majestic lower falls and slowed down how the eyes see the water movement, which I could only do after the sun had slipped almost entirely behind the mountain. The smooth cascade and deep green surroundings transforms this visual capture of an iconic place from the usual scenic shot into a Fine Art image. As my analogies have gone for some time, for those of you who actually read what I say, this also exemplifies the downward fall I have been experiencing with my health. After a very long battle, hopefully my future posts will begin to elicit some hope in that department. We shall see. …Either way, I have captured some serious magic in my time, in my images and in my mind.